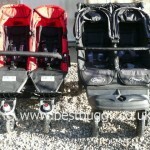 This set of photographs shows the TFK (Trends for Kids) Twinner Twist Duo side by side with the Baby Jogger City Elite. In some ways these pushchairs are very similar. They are side by sides, with good sized seats, large hoods, a basket, chunky off road swivel wheels and more. However there are a number of differences including the styling & brakes. Styling: The first thing you notice is the styling. The TFK Twinner Twist Duo is stylish, cool, fun, sporty and trendy. 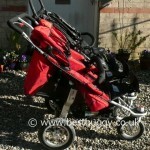 Sadly the Baby Jogger Elite looks quite old fashioned next to the Twinner Twist Duo. Size: The Elite is slightly taller when the hoods are open. The Elite is a little longer, wider and heavier than the Twinner Twist Duo. Fabrics: Both pushchairs fundmentally are made of a nylon type fabric making them both easy to keep clean. 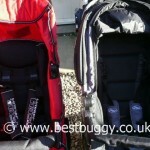 Child Comfort: Both pushchairs offer excellent padding in the seats. The Twinner Twist Duo has amazing padding in the seats and has special breathable fabric seats. The Twinner Twist Duo has footplates which raise up to three different positions, plus the calf rests lift up too to give maximum comfort for the children, especially when sleeping. The Elite has a fixed chunky footplate and the calf rests (kicker boards) also lift up to horizontal. The Elite footplate is quite low down. My tall 2.9 year old is unable as yet to rest her feet onto the board which isn’t a bad thing as she has plenty of room to grow. Both pushchairs will easily take a tall, large child. Seat Recline: The Twinner Twist Duo has only three seating positions – upright, partial recline, lie flat recline. This is achieved using two sets of zips which are a little fiddly especially if you are reclining both seats to flat. The outer zips aren’t too bad but I found getting the zip to the bottom of the seat (they have to be right down to recline properly), and then finding the zip later to pull back up was difficult. However the Trends for Kids have thoughtfully put loops onto the zip pulls which really help to locate and pull the zippers back up, especially the ones between the two seats. The Elite has a one handed toggle recline which means that you can recline the seat to any angle between upright and lie flat. It takes two hands to pull it back up again. But it is simple and easy. 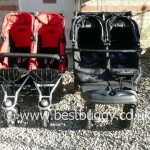 The seat units on both pushchairs are suitable from birth. 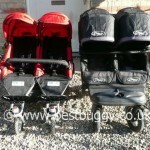 Carrycots & Car Seats: The Twinner Twist Duo can take two carrycots and also two car seats. However the Elite can not fit either carrycots or car seats. It is possible to put a soft cot into the Elite as a parent facing carrycot option. The Twinner Twist Duo can take a wide variety of car seats. The Twinner Twist Duo carrycots are well thought out with carrying handles, air flow hoods and collapse flat for travelling. Basket: The Twinner Twist Duo has a large basket underneath the pushchair, but access is restricted due to a central bar, making two sections. The Elite has one large basket with reasonably good access from the top, sides and also via the lift up kicker board below each seat. Storage Pockets: The Elite has a huge amount of additional storage which includes mesh pockets on the back of the seats and a double parent console which has 12 pockets for all your bits and pieces. The Twinner Twist Duo also has a large fabric pocket on the back of each seat, plus small removable zipped pouches on either side for bits and pieces. 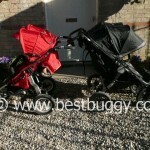 Hoods: Both pushchairs have large hoods. The Twinner Twist Duo has a stiff flick out visor which whilst isn’t huge, it does help shield a child’s eyes from the sun. Overall the Elite has a better hood which comes low down over the child. 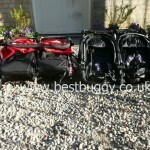 Handling: Both pushchairs handle very well with a toddler and baby on board. However the Twinner Twist Duo is lighter and nipperer. Both have great suspension. Both are comfortable to push with an adjustable handle to find the perfect height ranging from high to low. The Elite’s handlebar however does come much higher up. Brake: The Elite has a handy handbrake whereas the Twinner Twist Duo has a footbrake. 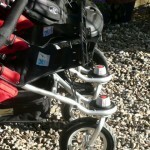 However the Twinner Twist Duo also has a hand disk brake on the handle making this a great jogging pushchair. 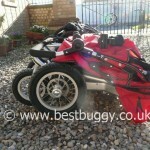 Tyres: The Twinner Twist Duo has pneumatic air tyres. The Elite has ‘forever air’ tyres so should need no maintenance. Fold: The Twinner Twist Duo is a tri fold. It is easy to do, but there are lots of small steps eg folding the footrests, ‘breaking’ bars at either side, undoing a safety catch before folding etc. 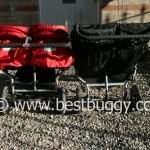 but the Elite is extremely simple and folds in half using the standard Baby Jogger ‘grab the handles and pull’ method! The Twinner Twist Duo is much neater when folded. The Twinner Twist Duo will fit into the back of a Mini! 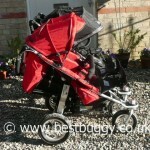 However the Baby Jogger Elite stores more neatly when the two back wheels are simply popped off. 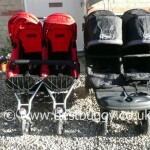 Which would Best Buggy choose? 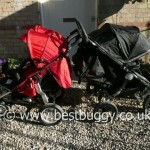 : These two pushchairs are very evenly matched. The Elite really has the edge on the features eg larger hoods, toggle recline, ‘forever air’ tyres, better range of handlebar height, easy fold etc. 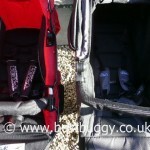 However the sporty looking TFK Twinner Twist Duo has the fantastic adjustable footplates, extremely comfortable seats, hand brake for jogging and can take two carrycots and car seats. On balance we would probably choose the TFK Twinner Twist Duo because it is a better all rounder with great looks to match. Note: Please use this quick summary in conjunction with the more detailed individual reviews. More Baby Jogger City Elite Double Photos with Children! 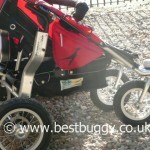 Baby Jogger City Elite with Children! Whats the price differance? 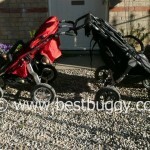 Jogging with a double – small fronts and only 12 inch backs would be hard (not that I feel the need to jog) I know Baby Jogger, Mountain Buggy and many others warn against this…….you really need fixed front with adustable tracking and big (16 inch +)back wheels with narrow tyres or you will be kicking the shopping basket. 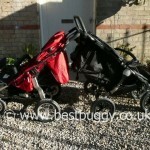 Baby Jogger and Bob Strollers offer double joggers – sadly not UK Safety Approved. Are TFK sure this is a jogging model? I dont believe the Twinner Twist Duo is a specific jogging model but the TFK rep said that it would be fine for light jogging ie not a serious runner! The Mamaboard (skateboard for parents) can apparently be fitted to the Twinner Twist Duo, and that looks a lot of fun. I believe the RRP for each is exactly the same apart from 99p! ie £599.99 for the Elite and £599 for the Twinner Twist Duo.